Over the course of nearly twenty years, Wes Anderson has cultivated a distinct and idiosyncratic body of work that has made his one of the most easily and readily identifiable voices in American cinema. 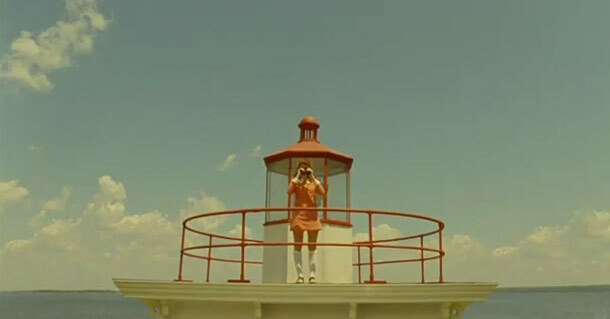 So much so that, from the very first frame of Moonrise Kingdom, it is obvious that only one man could be behind the camera. As the camera moves smoothly across a horizontal line, charting out the rooms of the house of Walt and Laura Bishop (Anderson regular Bill Murray and newbie Frances McDormand), their three sons and their daughter Suzy (Kara Hayward), the film immediately establishes the deadpan humour, immaculate framing and slightly distant and affected tone that have become the most obviously signifers of Anderson's films. (Other signifiers included in the film but not its opening include: references to the works of Charles M. Schultz, '60s pop - though it is set in the '60s, so that's only appropriate - and pieces of theatre involving children.) In fact, the film is such a pure distillation of Anderson's style that it could legitimately pass for a work parodying him. ( Seriously, apart from a few moments when the nature of the scenes make it impossible, I don't think there is a single frame in the film that is not perfectly perpendicular.) That's not necessarily a problem with the film, since there's nothing inherently wrong with an artist with such a distinct way of storytelling using it to its full, but it will still be an obstacle that those viewers who are not already firm Anderson devotees might struggle to overcome. Then again, that has been the case for some time now: if you haven't been able to stand Anderson's weird tics and foibles in his previous films, then it is unlikely that Moonrise Kingdom will change your opinion of him. Its tale of young lovers Suzy and Sam (Jared Gilman) running away on the sort of romantic adventure that would not be out of place in the fantasy novels that Suzy reads (and, despite their impracticality, brings with them on their journey) gives Anderson plenty of opportunities to indulge his love for pieces of '60s nostalgia - the film has a haziness to its visuals that makes it feel like a lost work of the period, rather than one merely set in it - and in creating a world through the minutiae of production design. The Bishop house is as meticulously constructed as the Belafonte in The Life Aquatic With Steve Zissou, whilst the broader world of the island of New Penzance is populated with the sort of strange, broken characters that are legion in Anderson's work. Put simply: if you aren't part of the Wes Anderson club, then this film is unlikely to make you decide to join up. Then again, if you are in the club already, there is plenty to love. As with the best of his films, Moonrise Kingdom draws its emotional power from the contrast between the perfection of its frames and the messy, tumultuous lives of the people who stumble through them. Whilst Suzy and Sam's story is shot through with a romanticism that can only come from children in the first flush of young love, the adults in the film all live lives of undeniable, unfathomable sadness and loneliness. Murray and McDormand's marriage is in such a bad state that they are only seen in the same room together after their daughter's disappearance forces them to come together, and the nature of their relationship is beautifully illustrated in a conversation they have whilst lying in their (separate) beds. McDormand says that they have to stay together because they are all that their children have, whilst Murray, in his typically understated hangdog fashion, replies, "It's not enough." Meanwhile, the two authority figures leading the search for the young lovers, Captain Sharp (Bruce Willis) and Scout Master Ward (Edward Norton), live their own lives of quiet desperation, as the former suffers through crippling loneliness barely alleviated by an affair, whilst the latter pours all his energies into trying to make his scout troupe the best that it can be to distract from his own sense of isolation. Probably the greatest strength of Anderson and Roman Coppola's script is the way in which it grounds its childish romantic fantasy amidst the failure and disappointments of adulthood, never allowing one to overwhelm the other, creating an intensely poignant blend in the process. The other great strength of the script is that it manages to be uproariously funny. Whilst Moonrise Kingdom might be the most overtly melancholy film that Anderson has made since The Royal Tenenbaums, it's also one of his most consistently hilarious. A large amount of the credit for that should go to his leads, who both give funny, likable performances that capture the burgeoning affection of young love and Anderson's particular deadpan style. Elsewhere, Anderson manages to indulge in some moments of slapstick and a few instances of high adventure in the film's almost apocalyptic final third, but for the most part the laughs come from a sly, witty script. Whilst it's too early to say if Moonrise Kingdom is Wes Anderson's best film, it's certainly one of them, and is a pretty wonderful summation of everything that his fans love - and his detractors hate - about him. Whimsical and heartfelt, tragic and hilarious, artificial and painfully real, it's a wonderful, charming film that will either delight or enrage you, depending on where you stand on its creator. I like Wes Anderson; I loved Moonrise Kingdom.